Lawn Care Solutions provides professional lawn care and landscaping services in South Austin, TX. We take pride in offering the best lawn care service in the area. At Lawn Care Solutions, our professional and committed teams will assist you with all your lawn care and landscaping needs. If your home in South Austin, TX needs lawn mowing service our experienced and hard-working team members are ready to help you out. Whether in the field or in our office, we strive to provide the best services possible. Our South Austin, TX lawn mowing services include mowing the front and back lawn. Line trimming around the house, fence and the obstacles on the lawn with a string trimmer, sidewalk and driveway edging and blowing off the front porch, back porch, and front driveway. Based on how often your lawn needs servicing, we offer weekly and bi-weekly lawn mowing services. Our weekly lawn mowing service is the most popular service, and our customers highly recommend it. This service guarantees your lawn will always look great. 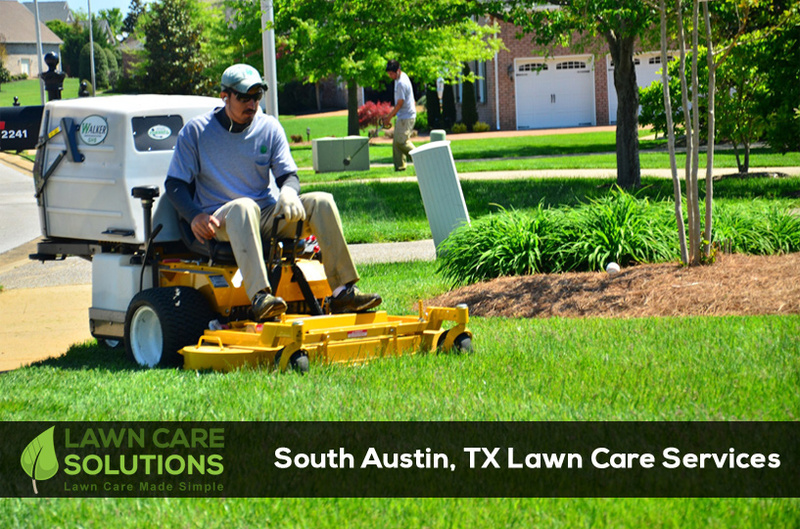 Lawn Care Solutions has served the South Austin community for many years. We take pride in earning our customers’ business. We don’t call the job finished until you’re 100% satisfied. To find out more about our services and to get a free quote call Lawn Care Solutions today. Call us today at 512-649-2000 to discuss your lawn’s needs. You can learn about the Lawn Care Solutions advantage from our friendly staff. We appreciate each and every one of our customers and strive to make their lawn care experience better than ever. We hope to serve you soon!